From 17th to 27th of September 2015 the 66. 'Internationale Automobilausstellung' in Frankfurt visites interested guests from all over the world to impress by the latest trends and innovations on the automotive market. 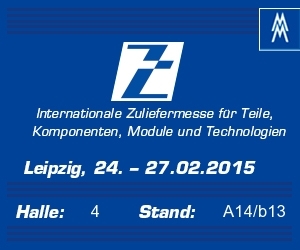 We are represented with our products in cooperation with the exhibition stand of Thuringia in hall 4.0, stand E07. Test the quality of our products for yourself! From 13th till 17th of April 2015 the HANNOVER MESSE is uniting ten international guide fairs under the topic "Integrated Industry - Join the Network".